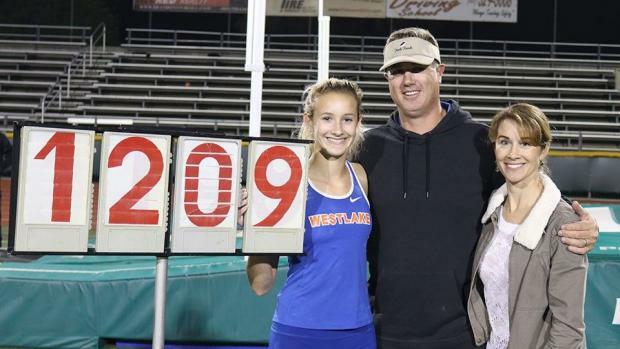 Paige Sommers (pictured with her family after winning the Ventura County Championships) is the top pole vaulter in the US in the Class of 2021. She will need a 7.50-inch PR to equal the CA record for sophomores. There are no easy records on the CA books. We only saw one fall in 2018 and that was by Sondre Guttormsen in the pole vault. Guttormsen, a transfer from Norway to Davis Senior (SJ), is an elite international junior vaulter. He was an outlier among CA vaulters, setting both the State and State Meet records -- among others -- in an incredible season of jaw-dropping vaulting. We almost saw the dusty old 100-meter record fall, but Yucaipa senior Asani Hampton fell 1/100th short of equaling the 1985 mark by Hawthorne's Henry Thomas of 10.25. Hampton had the luxury of running the near-record race on his home track at his league finals but the unfortunate luck of essentially no wind (0.1). A little push of even 1.5 meters per second may have made the difference in history and almost. While it looked like a year when the boys high jump mark of 7-04.50 would fall when both Sean Lee (Trabuco Hills/SS) and Jake Grimsman (Vista del Lago/SJ) each cleared 7-3 early in the season, it didn't happen. Grimsman was injured only moments after his 7-3 clearance at Stanford and Lee had no one left to push him over that final hump despite a season of amazing consistency over 7 feet. Distance marks on the girls side that appeared potentially in jeopardy because of the depth of elite competition pushing each other, also withstood an historic 2018 season. While 2018 was the deepest in the last decade -- if not ever -- in the 1600, it did not produce the fastest individual. Polly Plummer's converted 4:33.65 from 1982 looks like it will be around for quite some time to come. As with the boys high jump, injuries took a toll on potential record pursuits. Junior Claudia Lane (Malibu/SS), who ran the sixth-fastest 3200 in CA history as a sophomore (9:57.52), was injured and unable to compete beyond a couple of mid-season meets. Had Lane been at full strength and on the hunt, could Kim Mortensen's 1996 mark of 9:48.59 been the target? Same with two-time State Meet 800 meter champion Alyssa Brewer (California/NC). Brewer, who was injured at the end of the season and unable to compete at State, had twice beaten Cathilyn McIntosh (Del Oro/SJ) to the line at the State Final. With Brewer out of the picture, McIntosh ran 2:05.22, one of the fastest times in meet history. Had Brewer been healthy and primed to peak, how much could they have pushed each other toward Amy Weissenbach's 2011 standard of 2:02.04? That's an epic mark and hard to fathom even these two amazing two-lap runners offering such a challenge. But, as we all know, competition creates amazing results. And that's why we love this sport. With that as a backdrop, we offer the following records that could be vulnerable in the 2019. Included with each entry is the athlete we expect to lead the pursuit of these marks, and we respectfully challenge them to rewrite history. Top pursuer: As a junior, Jocelynn Budwig (Fowler/CS) threw 174-02 at the State Meet preliminaries. While her year-over-year (YOY) growth from freshman to sophomore year was 18-7, her YOY from sophomore to junior was just 4-4. Another growth spurt similar to freshman/sophomore and she's there. Note that Jelmini owns the junior record (183-11), senior record (190-03) and State Meet record (186-09). Her junior-to-season progression: 6-4. Top pursuer: As a freshman, Faith Bender (Liberty/CS) threw 160-07. During the summer after 8th Grade, she threw a 160-09 PR. She is skilled beyond her years, already with four meets of 160 feet-plus. Is a 17-foot improvement YOY unrealistic? Consider that 2018 State champion Erica Grotegeer's YOY improvement between her sophomore and junior seasons was 17-8. Could Bender produce similar improvement freshman-to-sophomore? The foundation for huge YOY growth appears to be there. Top pursuer: Paige Sommers (Westlake Village/SS). As a freshman, Sommers cleared 13-00.50, won the Southern Section Division 2 title and placed 3rd at the State Meet. She is the top-ranked pole vaulter in the US in the Class of 2021. Sommers had six meets of 12-5 or more. Helping everyone in this event is that the girls pole vault competition in 2019 could be one for the books, at least in terms of depth with eight of the top 10 vaulters from 2018 all returning, including the top six, State Meet champion Laurel Wong leading the way. What did we write about competition? Top pursurer: Jamar Marshall (Stockton St. Mary's/SJ) finished his sophomore season with a wind-legal PR of 13.97 and an all-conditions mark best of 13.68 (2.3). He's already very polished at the event for a high school sophomore, which makes us think not only could Marshall potentially threaten Craddock's junior class mark but also eventually Joseph Anderson's all-time CA mark of 13.33. With 0.3 less wind at the TCAL Championships, Marshall just may have eclipsed Anderson's sophomore record of 13.77. Marshall will benefit next season from the competition of Warren Williams (Merrill West/SJ), who had the state's #2 all-conditions time this spring of 13.74 and competes in the same. Top pursuer: Rachel Glenn (Long Beach Wilson/SS). As a sophomore, Glenn cleared a state-best 5-11 and tied for the State Meet title at 5-10. Is a three-inch improvement possible? If so, she would be only the fifth girl in state history to clear 6-2. Top pursuer: Great Oak/SS. The Wolfpack distance program is always a candidate to break any of the long relays and already owns half of the top marks in the top 11 in this event. The 2019 girls distance crew for Coach Doug Soles may just be his deepest yet. For one of the elite programs in the US, that's saying something. Top pursuer: Serra/SS. The Cavaliers had a CA-leading 45.69, recorded at the State Meet final, with junior Jazmyne Frost on the anchor. Frost is back, as are three of the members of the program's State championship team. Is a 1.19-second drop possible? Top pursuer: Claudia Lane (Malibu/SS). If healthy and in top condition, as she was as a sophomore when she ran 9:57.52 (CA #6 all-time), than Mortensen's mark (set as a senior), could be in jeopardy. It undoubtedly will help the record pursuit by a deep group of nationally ranked top girls returning for 2019, including Kristin Fahy (La Costa Canyon/SD), Tori Gaitan (Great Oak/SS), Sylvia Cruz-Albrecht (Oak Park/SS), and Corie Smith (Buchanan/SJ). Fahy ranks US #7 among returners in the 3200, Gaitan is US #8, Cruz-Albrecht is US #11 and Smith is US #12. Including Lane, who is US #10 (from limited racing in 2018), 14 of the top 33 returners nationally are from CA. Top pursuer: Jacqueline Duarte (Chino Hills/SS) ran 4:44 as and placed 3rd at the State final as a freshman soccer player in her first season of track. With training and full focus toward running faster four-lap races, the sky certainly seems the only limit to what Duarte may produce. 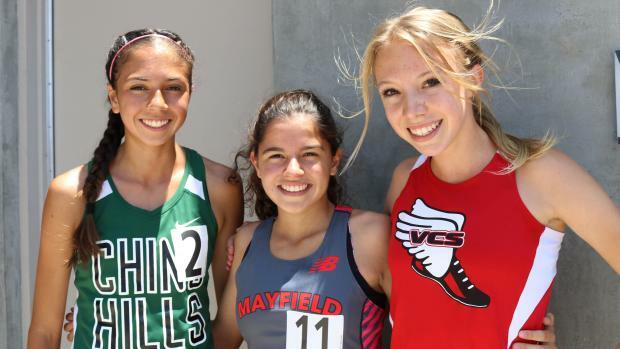 And she is not alone: Two other State Meet medalists in the 2021 class, Mia Barnett (Village Christian/SS) and Audrey Suarez (Mayfield/SS), both warrant inclusion in this conversation. This historic trio -- ranking #1-2-3 in the US in the Class of 2021 -- very likely will continue to push each other into the record books. Jacqueline Duarte, Audrey Suarez, Mia Barnett are US #s 1-3-2 among 1600 runners in the Class of 2021.